Build a charcoal fire on an outdoor grill for both direct and indirect cooking using Kingsford® charcoal by situating the coals on only one side of the grill, leaving the other side void. Cook the peppers over direct heat for 5 to 7 minutes or until they char and have softened. Remove the peppers from the grill, and preheat the grill covered to 250°F. Dice the habanero and one of the jalapeños and set aside. Cut the remaining pepper into thin strips. With a sharp knife, cut a 1/4-inch slice down one side of the tenderloin without cutting all the way through. Roll the tenderloin on its side and slice again. Repeat this step until the tenderloin can lay flat. Place the tenderloin between two sheets of Glad® ClingWrap. With a saucepan, pound the tenderloin out to a thickness of 1/4-inch. Discard the cling wrap and lay the tenderloin flat. Arrange the sausage, cream cheese and jalapeño strips evenly over the tenderloin. Roll the tenderloin into a log and trim the edges. Wrap the roll with the bacon strips. In a small bowl, combine the sugar, chili powder, cumin, and salt and mix well. Season the tenderloin liberally with the spice rub. Grill the tenderloin over indirect heat covered for 1 hour or until the bacon is crisp and an internal temperature of 160°F is reached. The subtle flavor of the hickory balances well with the heat of the jalapeños. 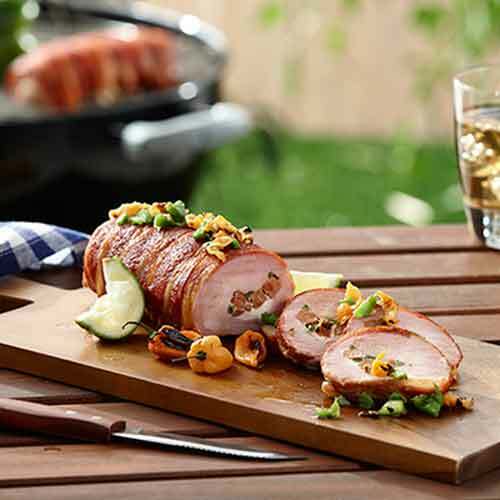 Credit: Recipe created by world champion pitmaster Chris Lilly on behalf of Kingsford® Charcoal.